Udon Thani is the largest city in the Isan region in Thailand’s northeast and lies just 50 kilometres from the Thai/Laos border. The city offers everything an expat could want. Shopping, healthcare, great recreational facilities including parks with tennis courts, outdoor gyms, walking, cycling and jogging tracks. Udon Thani boasts four 9-hole golf courses where a round will cost less than $10—including a caddie. Entertainment and culture come together in the Chinese Cultural precinct just behind UD Town mall (Thailand’s largest open-air shopping centre). 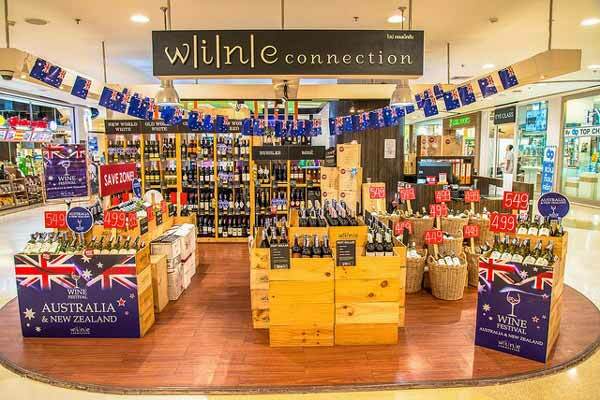 UD Town has three major supermarkets including the expat-orientated Villa Market. Spread along five distinct yet connected zones, the 13,000-square-metre, open-air shopping centre is also home to the UD Bazaar Night Market. You’ll be spoiled for choice for dining options here, from street food stalls to upmarket bars and restaurants. Prices start as low as $2 so whatever your budget and appetite you’ll find something to suit you here. Udon Thani’s international airport here also makes for ease of travel in and out with domestic flights to Bangkok, Chiang Mai, Pattaya and Phuket and international flights to Hong Kong and beyond. 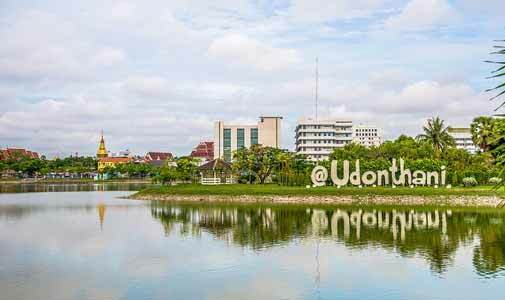 Udon Thani is definitely a place worth considering as an expat destination, especially for people who have already spent some time living in Thailand and have picked up some of the language. There’s a solid expat club operating in the city, with an estimated 10,000 members, as well as service clubs like Rotary actively working within the community. This makes living and socialising here easy. The Expats Club hosts monthly meetings and casual brunches three times a week where members get together, share information and support each other. Annual membership is 600 baht ($25) or if you just want to drop by a monthly meeting, it’s $4 for non-members to attend. Healthcare is not an issue as Udon is serviced by three large private hospitals, a specialist heart clinic and two public (government) hospitals. 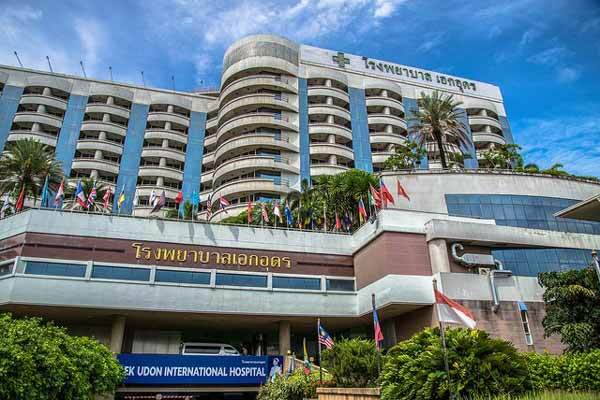 Bangkok Hospital (private) offers local expats and their immediate families a standard 10% discount on medicine, medical supplies and rooms. AEK International hospital (also private) has a residents’ discount card that offers a designated ‘health care month’ each year where full check-ups and other services are offered at attractive discounts. You’ll find great value here when it comes to property too. Udon Thani is an exceptionally affordable location. Apartments here start from about $53,000 and houses from $100,000. A budget of around $2,500 for a couple could see you living well here. Like anywhere, it’s always wise to rent before you buy. There’s a decent selection of apartment blocks like Lumpini Place UD-Posri, The Base by Sansiri and Skyland Condominium. Many have been built in the last five years or so, have on-site communal swimming pools, gyms and security and are all in convenient locations with easy access to the city centre. Studio apartments start at around $350 a month. You may prefer a house or villa with some outdoor space. To find these, you will need to look a little further away from the city centre. Often in gated communities— some developments have a communal pool, gymnasium and central barbecue areas. Rental costs for villas or townhouses start from a very low $410 a month, either furnished or unfurnished. Many expats prefer a modern Western-style kitchen and furnishings. As an example, a neat, clean and well finished three-bedroom townhouse with two bathrooms in Usabuy Townhouse Village, air-conditioned throughout with a TV and a spacious kitchen can be had for $600 a month. The location is excellent. Within five kilometres there is Nong Prajak Park, two shopping centres, night markets, the airport and bus terminal. If you’re looking for a life outside of Thailand’s main expat hotspots, Udon Thani could be the place for you: It offers city life yet easy access to natural beauty and attractions nearby. Easy travel in and out thanks to the international airport. And the neighbouring country of Laos is just an hour’s drive away.